Well the 2014 project for Water Country USA in Williamsburg, Virginia has been reviled, finally. A massive new waterslide will grace the park for next season. The well leaked plans for the ProSlide have been going around the internet for a few weeks now, as always the awesome folks at BGW Fans are on the ball again! A more devoted bunch of theme park stalkers than myself (shocking, I know), these people always hit the money. The ride will have the clover shaped tubes and will feature two major elements- The "wave" and The "funnel" with an over ride length of 552 feet and said to give you a 'weightless experience'. True to its name, this mega-slide promises to deliver an action-packed adventure. Thanks to a unique combination of high-adrenaline elements, there’s nothing like Colossal Curl in North America. 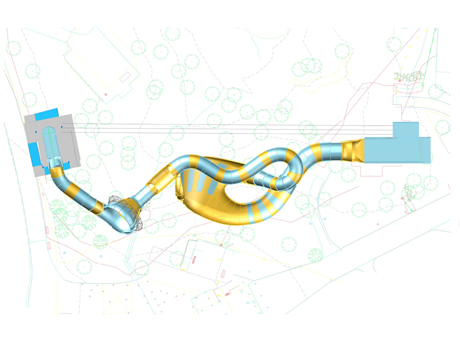 The ride starts with a funnel feature, which will swish and swirl guests before whisking them through the ride’s enclosed colorful tubes on their way to a wave element that hurtles them high above the park.